I am still grand-fathered into the AT&T unlimited data plan on my iPhone, so it didn't make sense for me to go with a shared data plan when I bought my LTE iPad. So the choices were a pay-as-you-go plan from either Sprint, Verizon or AT&T. My earlier post detailed out the cost differences between these options, but the real decision for me was based on coverage. I looked at all the places I traveled to for work and compared the coverage between Verizon and AT&T. Well, my trip out to Vandenberg Air Force Base (VAFB) last week was all the proof I needed that I made the right decision. I had LTE coverage almost everywhere I went, even when driving between Lompoc and Solvang where I totally lost all AT&T coverage. The Verizon LTE coverage even held up when I was out on the remote edges of VAFB, just like the Verizon LTE coverage maps indicated. Not having AT&T LTE coverage near my home also played into my decision to go with Verizon, but as it turns out, just a few days after purchasing my iPad AT&T flipped a switch and the area around my house now as AT&T LTE. I have to say that I do use LTE on my iPad when I am out and about close to home just about as much as I do when I travel. Being able to do work while waiting on my daughter at soccer practice or at my son's basketball practice is a HUGE time saver for me. But in the end choosing the carrier that had the best coverage for me when I was out of town and traveling for work was the right decision to make. In my October 24th post I talked about who the iPad mini would work well for and who it might not work so well for. I firmly put myself in the category of not being a "good candidate” for an iPad mini because of the large amount of content creation I do on my iPad (specifically at work). I am now using a brand new iPad mini (64 Gb white Verizon) as my one and only iPad. What happened? Until last weekend I was using an iPad 2 and my wife had a 1st generation iPad. My wife’s 1st gen was, well, becoming non-functional. So it was time to do something. I tried (I really did) to talk her into getting new iPad, but I have a practical wife. She knew I was running out of space on my iPad and that I had been talking about really wanting to have cellular data with the amount of traveling I was doing for work...so she inherited my iPad 2 and I purchased a new iPad. So what changed my mind about me doing too much content creation to be able to go to a smaller screen? Two main reasons for my change of heart: my main work laptop and the situations I use my iPad for instead of my laptop. My main work laptop is a 13” MacBook Air which is not that much larger than my iPad 2. My main work use for the iPad is to use it in meetings instead of a laptop. I find using a laptop in meetings with the vertical display being up and open between me and the people I am meeting with to be a bit distracting. The whole purpose of a meeting is to MEET with people, not to insert a screen between you and them. I also don’t like people having to use their imagination about what I am doing on my laptop during meetings. Is he really typing away and taking notes or is he doing an internet search on how to beat the level he is stuck on in Angry Birds? Because the iPad is nearly horizontal when being used on a conference room table vs the vertical screen of the laptop there is less perceived privacy with the iPad, therefore less of a mystery on what you are doing on your iPad. The iPad is much more like just carrying around a pad of paper and is, at least in my opinion, a lot less likely to be seen as something that is distracting me during a meeting rather than aiding me to be more productive. The iPad (and all iOS devices) after all operate in the mode of one app at a time. For me, true multi-tasking on-screen is a real distraction. For example, I only get email if I open the email app (and have hidden the mail app to keep me from being able to read email with 1 tap) so the iPad is not a distraction in a meeting for me like a laptop can be. So given that my iPad 2 and my 13” Mac Book Air were so similar in size, there wasn’t a huge portability factor in me choosing to grab one over the other. Not the case with an iPad mini. Choosing to grab an iPad mini over my laptop WOULD be a big difference in the size of device I was lugging around. So for my use cases for an iPad the iPad mini seemed to make more sense, but would it be big enough? I had 2 main concerns...work and music. From a work standpoint the iPad needed to be big enough to take notes (both typed and hand written) and big enough to be able to do diagraming and graphics work on the go in OmniGraffle. So I headed up to my local Apple reseller down the road and started playing with the iPad mini. Typing wise, the on-screen keyboard worked just as well as on the full size iPad (at least for me and my hobbit sized hands...they really are quite small). I did some tests typing a full paragraph on both the mini and the full sized iPad and I was able to type just about as fast with the same amount of mistakes on the mini as I was the full sized iPad. In fact, I am writing the last half of this blog post on the mini while on an airplane. For handwritten notes I use Notability and on the mini I actually like hand writing notes better than on the larger screen. I’m not sure why that is, but it seems more natural to physically write on the smaller screen (maybe because it’s closer to the size of a small pad of paper than a full 8 1/2” x 11” sheet of paper). Also, because the screen is smaller the issue of accidentally resting your hand on the screen while writing is greatly reduced. So typing and writing worked great for me. Diagraming in OmniGraffle also seems to work just fine. My workflow with OmniGraffle tends to be to start on the iPad and using a stylus to sketch out what I want in one layer and they add the stencil items on top of my sketch. From there I tend to move over to the Mac to do the more “fiddly” things like creating and moving the text and doing the formatting. So again. the iPad mini worked really well even for diagraming in OmniGraffle. So how about music? 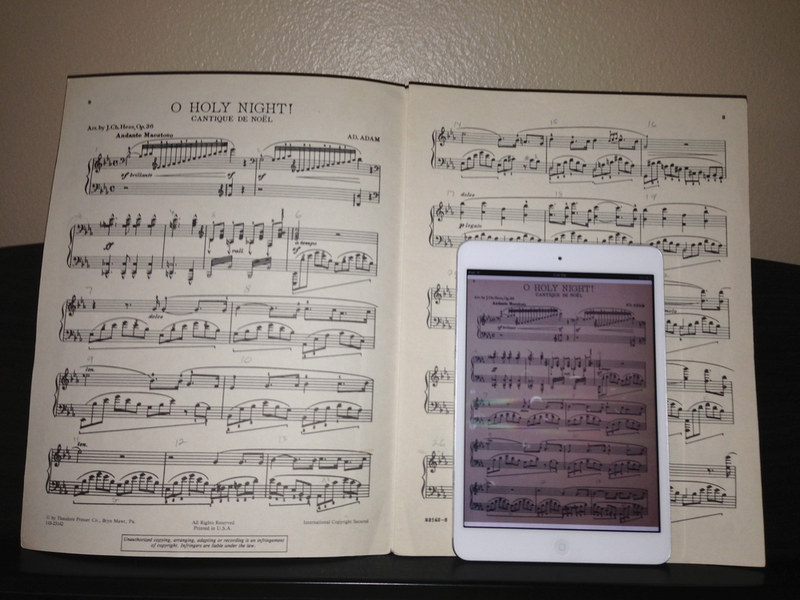 Is the iPad mini big enough for sheet music? Which pre-paid carrier & data plan to choose? Now for the big question...which carrier to choose and do I sign up for a dedicated plan, go with a shared data plan or go pre-paid? First the carrier choice. For me, it was between AT&T and Verizon because I wanted LTE and I wanted to use the iPad for travel. My iPhone is with AT&T, but I am currently grandfathered into the "unlimited" data plan. So was it worth it for me to move to a shared data plan? The answer was no. My wife also has an iPhone with AT&T but she has the smallest data tier, so we would need to buy a shared data plan big enough to cover what we generally use per month combined plus what I expected to use with the iPad while on travel. A 1 Gb shared data plan would have actually been enough for my wife and I to comfortably share (yes, surprisingly I don't really use much of my "unlimited" data plan). So in order to to comfortably add the iPad on to that I would have to bump up the shared data pool to the next tier, which is 3 Gb. It ended up costing me an extra $30 a month to do that, which would buy me 3 Gb of pre-paid with AT&T. So why would I want to lock myself into any kind of contract or shared data plan? Better to stay flexible. Although I did seriously consider going the 2-year contract route given the current $100 rebate AT&T was offering when you buy an iPad and sign a 2-year contract. But my travel isn't constant enough that I will always need to buy data every month so it didn't make sense. So with the shared data plan out the window my choice of carrier was wide open. It really ended up boiling down to who had the best coverage and the most attractive data plans. As of right now Verizon has the better LTE coverage, but AT&T has the faster network when you are in areas that don't have LTE coverage (AT&T 4G is faster than Verizon non-LTE). However, given the places I travel to the Verizon coverage for LTE is excellent and even more important...locally I have LTE coverage with Verizon and not with AT&T. Although, 2 days after I purchased my iPad AT&T rolled out LTE in the Melbourne, Florida area! In the end it wouldn't have change my choice of carrier. I went with Verizon because of the better overall nationwide LTE coverage and even more importantly the more sensible data plans. I plotted up the cost per Gb for the AT&T and Verizon pre-paid data plans and the low end data option for AT&T on a per Gb cost basis is off the charts! At the low end of the data usage spectrum Verizon is clearly the more economical choice with being able to pay only $20 per Gb (with the $20 1 Gb plan) verses the $60 per Gb with AT&T (with the totally ridiculous $14.99 250 Mb plan). Once you hit the 2 or 3 Gb amount or greater the cost per Gb is comparable between the two. I've found that 1 or 2 Gb tends to be more than enough in one month for the average user, but 250 Mb is just not enough. For example, on the business trip I just came off of I used about 150 Mb over 2 days. It was a pretty light use of data with my only need being light email use and some web surfing (no video streaming or music streaming). So a data plan as small as 250 Mb just doesn't make any sense unless you are an extremely light data user and the $5 more to get 4 times the data on Verizon breaks your budget. Now, by purchasing the 1 Gb plan I have enough data left over to use for my next trip (which occurs before my 30 days on this pre-paid plan expires). That does bring up one important point...wifi hotspots. The AT&T pre-paid plans come with free access to AT&T wifi hotspots and Verizon pre-paid plans do not get you free access to their wifi hotspots. When I travel I'm not near enough AT&T wifi hotspots to make it worth considering, but depending on where you go it might make a difference for you. I know this was a long post, but since I really struggled to find any really good write-ups on how well the iPad mini worked as a sheet music reader and then trying to put all the pieces together to figure out the best carrier and data plan for me I decided to post why I made the decisions I did. Hopefully others find it helpful. I plan to write a post In a few weeks or so that talks more about how well the smaller iPad mini is working for me.